This guest post comes from Paige Johnson, who advises on weightlifting and strength training. The nutrition habits your teens develop now will impact their future health. Here are a few quick tips for instilling the values of a healthy body and mind. One of the best things you can do to encourage healthy food choices is to ask your kids to help you cook. Teens who play an active role in food preparation tend to be more open-minded about the foods they eat. Teaching kids to cook is also a life skill they can pass on to their own children someday. Another tip is to get them to spend time at the grocery store with you learning how to put together a well-balanced meal. 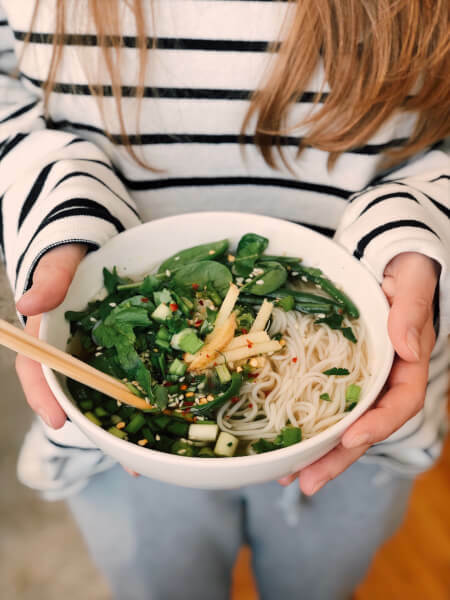 If budget is a concern, stock your pantry with low-cost staples such as brown rice and quinoa and let the kids pick a protein and fruits or vegetables to complement the meal. One of Plexus’ budget shopper suggestions is to buy in-season produce, which is typically less expensive and contains more nutrients than that which has been shipped in. Don’t prioritize a clean plate. Most of us were taught that a clean plate was the best way to determine if you’d eaten enough. But the Mayo Clinic says young people who are forced to eat when they aren’t hungry may grow up with an unhealthy relationship with food as adults. Instead, offer your children three to four different food groups each time you sit down at the table. Include at least one food you know they’ll eat, but don’t cater to their likes and dislikes. Snack time should likewise offer plenty of options including old favorites such as popcorn, bananas, and unconventional snacks like Gouda-topped apple slices. Reader’s Digest offers recipes for these and more than two dozen other healthy snacks that will capture the interest of kids of all ages. Keep in mind that your child’s appetite can change. The only time you should truly be concerned is if their eating habits change significantly and they begin to gain or lose too much weight. If this happens, talk with your child’s pediatrician to determine if there is an underlying medical problem. A healthy lifestyle involves more than just the food we eat. Young people should also be active outdoors for at least 30 to 60 minutes each day. KidsHealth.org offers a quick rundown of the different types of physical activities children can do to fulfill their exercise needs. One in three kids in the United States is considered overweight or obese. This causes long-term health problems and can be the start of unhealthy behaviors for generations to come. By letting your children have a say in their overall health and wellness now, you’ll instill positive habits that last a lifetime.